And you thought they were “just” hats. On the eve of Cincinnati hosting it’s 5th Major League Baseball All-Star Game, and first since 1988 when there was a ballot stuffing controversy involving Oakland A’s catcher Terry Steinbach, who was a 2nd year player batting .217 with 5 HR and 17 RBI, but played on the sexiest team of the late 80’s, so the Oakland fans stuffed the ballot boxes, literally, by reportedly nailing stacks of voting cards together to fit more in. That’s so 80’s analog style for ya. This year, there’s a similar joke of a fans cheating the online voting system that had the entire Kansas City Royals team starting, with Bret Saberhagen taking the bump. Or something like that… Back to Steinbach. The guy wore a dorky face shield, so he sure shocked 8-year old me the National League when he took a high fastball from the Mets Dwight Gooden and snuck a home run just over the right field fence on his way to leading the AL to a 2-1 victory and winning MVP honors. The reason I just went on a rant about the history of a Major League Baseball exhibition game is because the history of the game is not lost on Pro Image Sports. And it certainly isn’t on New Era, who took center stage Monday after rolling out three caps for the Midsummer Classic. If you are a geek for team licensed product like I am, you should watch this video of their design team discussing the development of the ASG hats here. New Era’s 2015 All-Star Game 39THIRTY Cincinnati Reds hat. Visit your local Pro Image Sports to pick up your favorite team’s All-Star hat today. 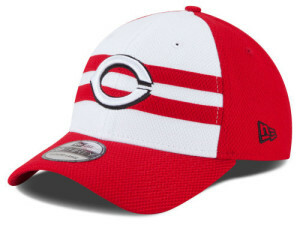 I thought it was cool hearing them discuss the lineage of the two-stripes in the uniforms of iconic Reds teams of yesteryear that found a way to incorporate into the 2015 on-field 59FIFTY hat pictured above. They also have a 39THIRTY hat for the event, and a cap for the Home Run Derby (pictured below) that hometown star, Reds third baseman Todd Frazier won (who happens to be the first hometown player to win the HR Derby since the last time the Reds won the World Series). I personally love what New Era is doing with what they call their “LiquidChrome technology”, which is 3-D type textures they’re using on their commemorative patches, giving the hats a vibrant pop. In the Reds case, this season marks the 40th anniversary of the World Series winning “Big Red Machine”, the most dominant National League team of the 70’s. New Era scored big with this year’s All-Star Game collection, because they didn’t take themselves too seriously, and brought the fun to a baseball hat. Just like Bryce Harper does in this ad with super model Nina Agdal. 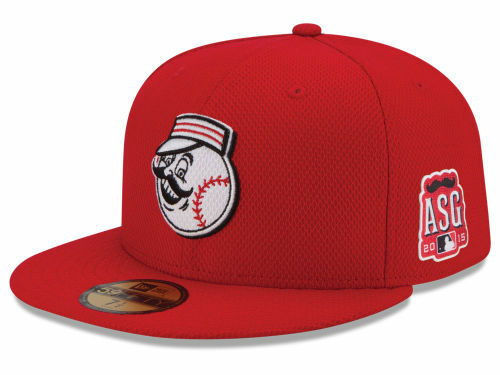 The patch on the Reds commemorative ASG hat is incredible. Maybe I like it so much because I’m a huge fan of mustaches, and believe they should be celebrated with every opportunity we get.